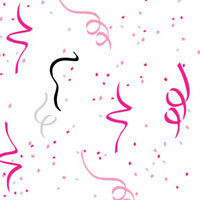 Party Confetti Hot Pink White Black Self Sealing Cellophane Bags 9 x 12 inch. 10 or 100 cellophane bags sold per pack. Use these beautiful bags for literature, samples, self promotion, and much more. Comments: These are cute and work perfect for my hostess packets! AND I ordered yesterday and received them today!! Amazing customer service! Comments: These are so amazing!! They make my host packets look super cute!